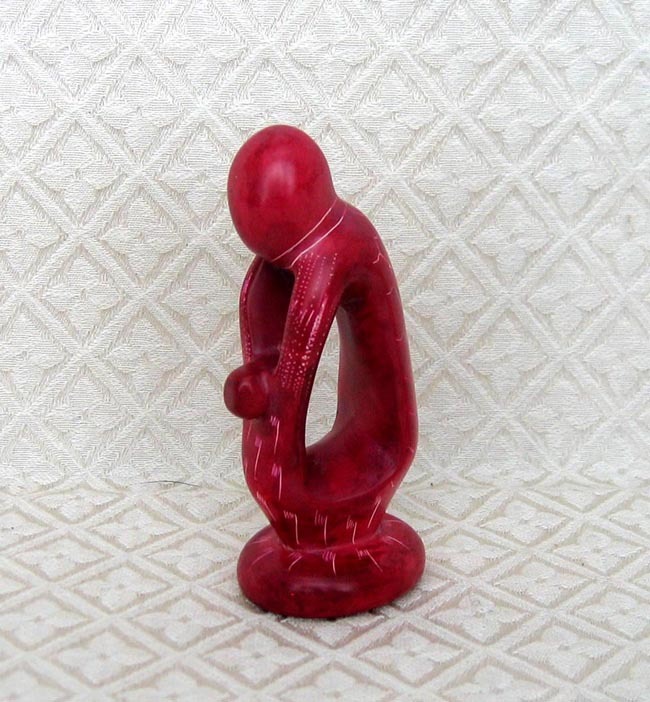 This magenta abstract statue of the Madonna and Child is carved from Kisii stone in western Kenya. The sculptures has a unique pattern etched into the painted surface, revealing the white stone underneath. The statue measures 4 inches tall. A large deposit of a uniquely colored hardened mineral steatite (pyrolite or volcanic ash), commonly called Kisii stone or soft soapstone, is found near the small village of Tabaka in the Kisii District of western Kenya, about a six-hour drive from Nairobi. Kisii craftsmen have carved soapstone into all sorts of shapes and designs, like pipes and utensils, for many years. The stone varies in color from rose to white with many variations between. These sculptures are each handcrafted without the use of commercial machinery.